We treat a variety of diabetes and endocrine disorders with the latest technology available. Our highly skilled Certified Diabetes Educators provide comprehensive diabetes and nutrition education classes. 1.4 million Americans are diagnosed with diabetes every year. Don’t let your condition go untreated. We are here to help. Learn about nutrition and meal planning, self-monitoring, managing medications, and much more. Log in to complete paperwork, view records & labs, communicate with your provider, & view your balance/make payments. Print and fill out your patient forms before your first appointment. Email our office to request an appointment today! Insulin pumps are designed to provide a rapid acting insulin infusion 24 hours a day through a catheter that is placed under the skin. 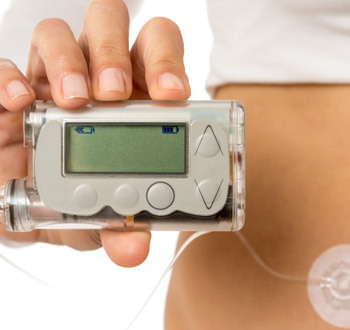 For diabetics who both qualify for and would benefit from insulin pump therapy, we offer initiation and management of insulin pump therapy and use pumps from all of the major pump manufacturers, including Omnipod, Animas, Tandem, and Medtronic. We pride ourselves on using the latest technology available to us in the field of diabetes, and as such we are one of the first practices in the area to start using the new Medtronic 670G Closed Loop Pump. Our highly skilled Certified Pump Trainers (CPTs) provide hands-on education to patients who are just starting to use pump therapy, to those who are upgrading pumps, and to those who need routine maintenance and refreshers. We will work with you to determine which pump best suits your needs and preferences and then walk you through the process to ensure you are comfortable with your new pump therapy.